Thank you to community reporter Dermot Cole for coming out on our opening day to talk to Bobby about beer, the brewery, and our taproom. Dermot always has a knack for creating excitement around local happenings, and this was no exception. Thank you Dermot! 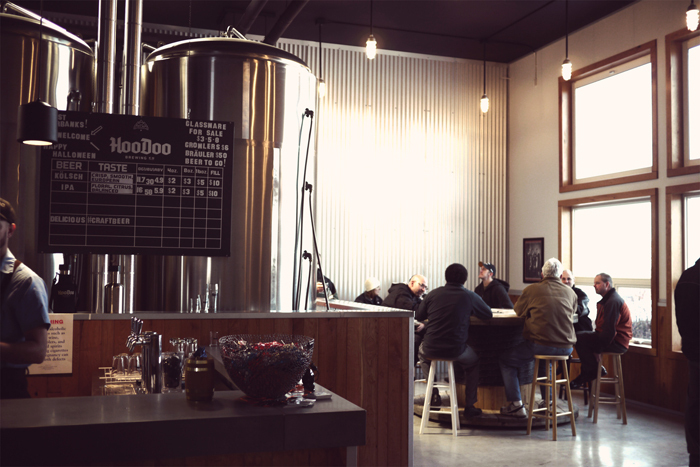 FAIRBANKS — After years of planning, the HooDoo Brewery and Taproom, a converted warehouse now filled with gleaming steel tanks, opened for business Wednesday afternoon. Bobby Wilken, the brewer and owner, inaugurated operations of the homegrown Fairbanks brewery with two launch beers — a Kolsch and an IPA. While Silver Gulch is a long-established enterprise in Fox, there hasn’t been a brewery within the city limits of Fairbanks since the early part of the last century. The HooDoo Brewing Co. is at 1951 Fox Ave., which is off Phillips Field Road near Florcraft in the railroad industrial area. The tap room opened at 3 p.m. and a steady stream of customers dropped by to get a glass of beer or buy a growler of craft brew to take home. The company also is planning to sell beer by the keg and supply local retail establishments. 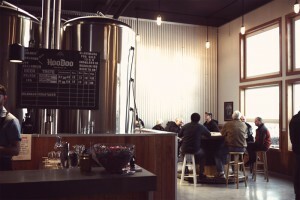 Brewing equipment dominates the inside of the building, but there is a handmade bar where customers can stand and order a beer to drink on the premises. HooDoo is licensed as a taproom, not a bar, so under state law it cannot have chairs at tables, TV sets in the background, food service and the other attractions that are more or less standard in bars. Wilken, a 32-year-old son of former Sen. Gary Wilken and former school board member Sue Wilken, has spent nearly a year-and-a-half renovating the 35-year-old warehouse for the business, working with his wife, Jessica, and others. The brewery is named for the mountains where the Arctic Man takes place every spring. As a college student in Missoula, Mont., Wilken studied business and lived close to Big Sky Brewing, where the owners allowed him to get a firsthand look at a small brewery. Wilken said he has been dreaming of doing this for more than 10 years and has been working on the business plan for several years. The brewing equipment is centered around a steam-heated 15-barrel system made by Premier Stainless of San Diego. The HooDoo Brewing Co. is open from 3-8 p.m. Tuesday through Friday and from 11 a.m. to 8 p.m. Saturday.